​2018 Grant Applications are open now. Must be turned in by September 1st. The Batavia Arts Council has joined Studio-Batavia Visual Arts Boosters in making a grant to the visual arts program in the Batavia Public Schools. 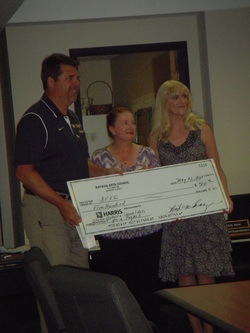 A formal presentation was made at the Batavia School Board meeting on Tuesday, June 25th. The two organizations joined together in funding the purchase of a “pugmill” to be used at Batavia High School and Rotolo Middle School. Making the presentation were Jim Sychta, husband of Boosters President Sharon Sychta, Arts Council President Julane Sullivan and Arts Council Board member Sharon Mitchell. Sychta, parent of an art student, is also an active artist at Water Street Studios in Batavia. Sullivan, the owner of All Dressed Up Costumes, is also the director of Shakespeare on Clark. Mitchell is active in the Boardwalk Restoration and of the Batavia Park Board. The Boosters and the Arts Council are pledged to improve the facilities for ceramics instruction in Batavia schools. A comparison of area high schools shows Batavia’s facilities as less developed than other art departments. Both groups advocate improving this imbalance. The purpose of Studio - Batavia Visual Arts Boosters is to encourage and promote the activities connected with the High School and Middle School Visual Arts Departments. Studio lends support both educationally and financially to the art students. Studio is a parent run organization supported by friends, relatives, art supporters and community. The goal is to aid the art teachers and students at Rotolo Middle School and Batavia High School and to supply those programs with support and needed equipment. Help us raise funds for scholarships and grant awards for local artists and art projects.